In my previous posts, I've described our web applications of CareGroup and Harvard Medical School that run anywhere on anything. At some point, as more and more software is offered via Software as a service providers, Web 2.0 applications, and operating system neutral thin clients, the notion of a desktop becomes a basic operating system running a browser. Such a device can be a very thin client without much local storage. Just plug a keyboard and flat panel screen into the wall and you're up and running! Very cool. Sony targets high end consumers; it leverages its physical media engineering prowess to build DVD burners into most of its models, something that few other light notebook makers even attempt to do. Sony's Vaio line is splashy and feature rich, but isn't commonly regarded as well built or durable. Panasonic is known for its ruggedized Toughbook line, designed to operate in rough environments. Its models commonly trade off high end performance and features for extremely light weight and compact size. That relegates Panasonic's fans to mobile business users, and makes it less appealing to mainstream consumers. Lenovo, which bought up IBM's PC division, continues the venerable ThinkPad line as a highly regarded workhorse that delivers top performance in a thin but well constructed case -- all work and no play. ThinkPads are also known for their long usable life and their fingertip controllers rather than trackpads, something that polarizes users for or against based on their personal preferences. Fujitsu is another leader in light and thin notebooks, but also makes more general purpose machines that borrow from its leading edge thin designs. Its larger sized lines are powerful and economical while still remaining thin and fairly light. Fujitsu also makes Tablet PC convertible machines with the flip-around monitors that have yet to prove popular because they are expensive. Dell was not discussed in the article, but my experience is that the Latitude line, such as the D420 with a wide screen, are light, durable, and economical. At CareGroup and Harvard Medical School, we deploy Lenovo and Dell Latitude laptops. 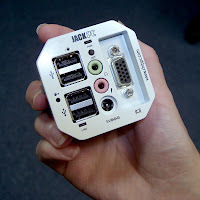 We looked at the Jack PC over a year-and-a-half ago through a reseller. It is great for space constrained areas. There were six challenges we saw at that time that were manageable. 1. The device uses shared video memory. 2. It is analog video. 3. It didn't support multiple monitors in a split-head configuration. 4. It wasn't PoE (a dream, I know, as well as an issue for heat in the old network closets). 5. There were few widespread adopters (we had a bad experience with earlier thin clients). 6. It didn't come with gig networking (desired for PACS viewing). They have addressed most of these challenges. This is a likely solution for our organization as opposed to using local network closet based, computer room based or data center based blade PCs. What's old is new again. Last one, the hardware mounting vendors didn't have housings for this form factor yet. They could do some custom stuff but it was a little costly. Seems we have come full circle back to dumb terminals again. There are a lot of systems that a thin client such as this could replace at my hospital. I researched them when I was the sole IT guy at a small psych hospital, we just didnt have the necessary back end infrastructure to support it though. Nice! Also, you had mentioned several tablet PCs in the article as well, but just wanted to take a short moment here and perhaps suggest a glance over the the Tablet Kiosk products. I have a video over at my blog and they have a couple things going on that are different with UMPCs that are modular, in other words build your own UMPC and they run Linux as well as Windows. The large Sahara also is a very slim slate and has dual array microphones and I find it useful even to walk around with it using Skype as a simple example. Anyway, just perhaps another vendor to look at for hardware and something different. Having the touch screen and digitizer is something I didn't think at first was going to be useful, but I find I now use the touch screen more and more when I am mobile and the new battery dock can get one up to 10 hours of mobile time too. Anyway, just thought it was worth a short mention here and I really like the weekly articles on the "cool technology of the week". I sure wish there were more contributors on the web with the same visionary focus with health care. Thanks again for taking the time from a busy schedule to share with all. I came across this great Apple Iphone web app that I've been using like mad since last week. For Exercise and Nutrition Tracking. Works fantastically on the Iphone, having a flavor developed just for it. I don't know if you have an iPhone, but I remember you mentioning the possibility of iPhones being used as a bedside device. This is the sort of app I could see being used bedside but geared towards hospital stays etc.